The Mystic Realms Faire ends tomorrow, so if you haven’t checked this event out yet, don’t wait! It’s two sims full of fantasy. I wanted to share some of my finds from the event. First, I love this hair from Exile so much. The crown is optional, as well as texture change. My jewelry is also from Mystic Realms, by Cae. My gorgeous skin is the newly released Grace from Belleza. 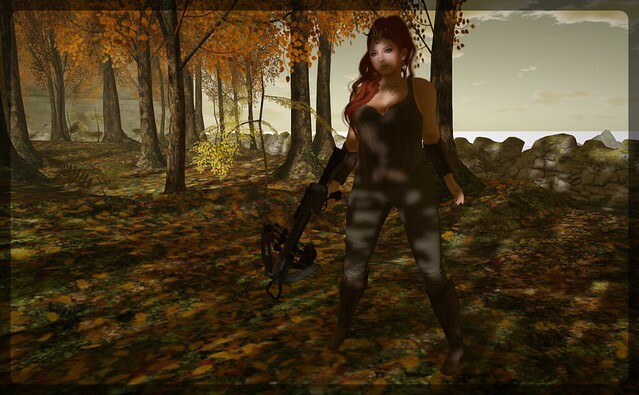 Koy released some awesome poses, complete with crossbow prop, for this event. And FATEplay has a new outfit, Surie, which is available in three different versions and plenty of color choices. This is my favorite version. The boots are included, too! For Mystic Realms, Consignment released this adorable little Planter’s Habitat home. 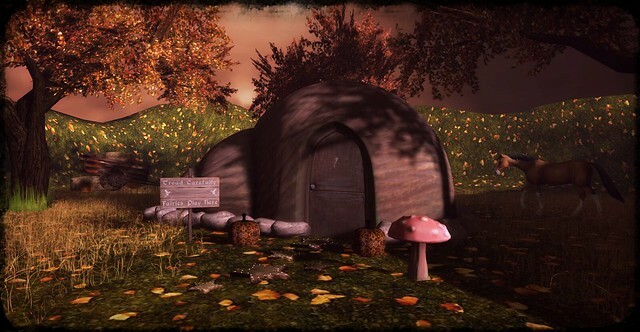 The mushroom seat and faeries sign are part of this set. Be sure to check out this great event before it ends tomorrow! 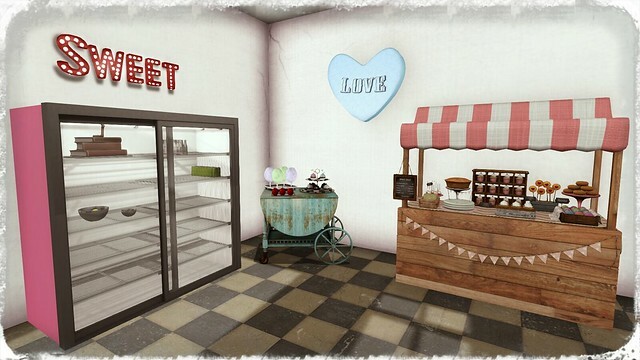 Now that it’s gotten a bit easier to get into The Arcade, I wanted to share some lovely home decor items you can find there. First up, tarte. 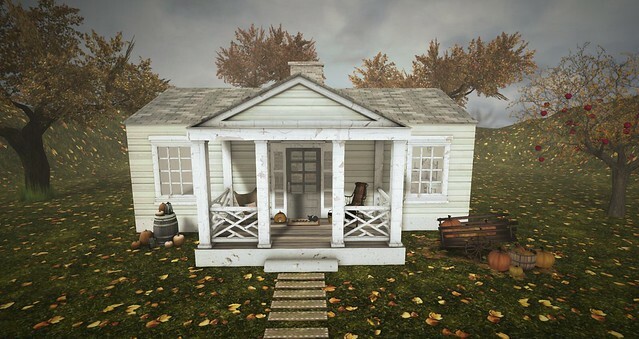 This gorgeous Autumn Cottage is the rare, but every piece in this set is lovely. On my porch is one of What Next’s cute and comfy chairs, along with a rocking chair and knitting basket from vespertine. 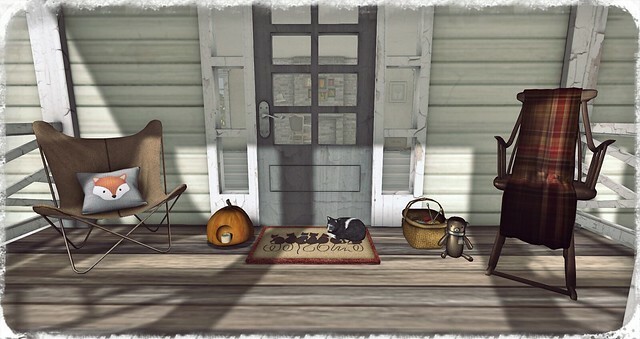 The doormat, complete with sleeping kitty, is from Sway’s. All of these items (not the pumpkin!) are available at The Arcade. 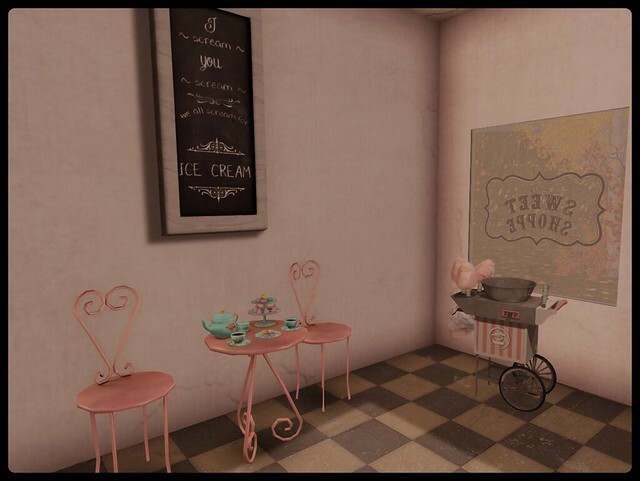 Inside, the walls and ceiling have an old, aged feeling that, if it happened in your RL house would probably be cause for repair work, but in SL it’s a lovely effect that creates a warm, lived-in feeling! 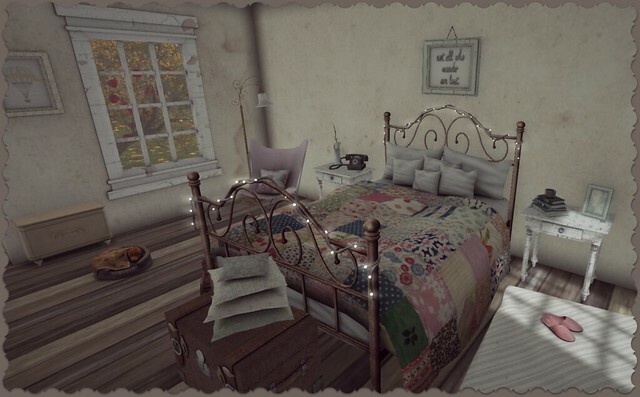 This gorgeous bed is also by tarte, but it is a mainstore release. My sleeping puppy, is the Ispachi Florian puppy that is just too cute for words. And it breathes. It’s utterly adorable. The slippers are also from the Ispachi set, as is the chest against the wall by the windo. I’ve placed another of What Next’s chairs in the corner. All the rest of the items are from tarte’s set. Be sure to check out the official Shopping Guide to help plan your Arcade wish lists and shopping trips! Enchantment is a fair tale lover’s dream event. This second edition features items inspired by the story of Little Red Riding Hood, and there are so many wonderful things to be had. 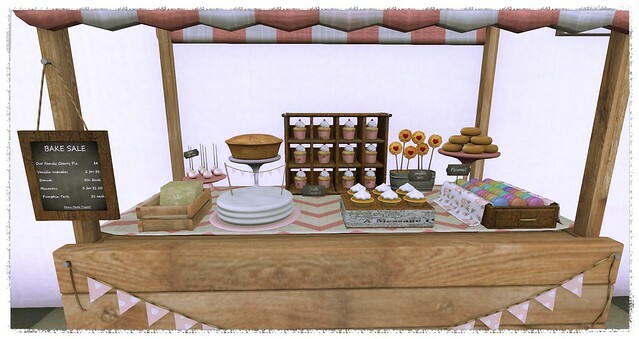 In this post, I will feature a few of the goodies you can grab at this event! First up, this stunning gown from Miamai. The gorgeous red gown (appropriately) has a hood, and I love the lining detail inside the hood. I paired this gown with the lovely Essences skin Harper, which is at The Dressing Room Fusion’s current edition. This version of Harper includes blonde brow and no brow options. Because I really love the style of the brows on this skin, I’m wearing the blonde, which I think are dark enough to work for gingery and lighter brown shades, too. This pose is also available at Enchantment, from Infiniti Poses. The Better To See You pack comes with a hud for SLink nails, naturally in several shades of red. However, here I wearing Flair nail polish. Next up, I’ve combined Enchantment items with some items from other fantasy themed events currently happening. My gorgeous wolf is from Enchantment, and is worn as an attachment that then walks with you. It’s available in multiple colors, but I was drawn to the white. My boots are from Half+Deer, also for Enchantment. They come in multiple color options, all of which include a hud so you can customize things like the soles and laces to better suit your needs. The dress is from Sweet Poison for the Fantasy Room, and comes with a hud that includes three color options – all for just L$70, I might add. I decided that after a hunt, I’d probably be grimy, so I took to Marketplace and found some dirt tattoos from BINA. I will caution, though. In the description for these tattoos they say they are “SLink friendly.” I mistakenly took that to mean they came with appliers for SLink hands and feet, but they do not. Despite what the description says, to me it looked weird without dirt on my hands, too. So I bought Adam N Eve’s dirt, sand and blood SLink tattoo appliers. They include a hud for the nails, which is pretty cool, too! This skin is Essences’ Song. I wanted a bare skin that felt as if it had a bit of… raw nobility. Honestly, I’ll admit it. I was going for a sort of grown up Arya Stark look. And yes, I know Arya’s not a redhead. It’s called creative license, people! My dreads are from Tableau Vivant, and they include versions for both men and women. The crown is by tea.s for We Love Roleplay. Finally, I fell in love with this dress and cardigan from Beetlebones. They come in a variety of colors, but I went for the traditional red for the cardigan and a grey print for the dress. My boots are fri.day’s Enchantment offering, and they’re crazy cute. The pose is another from Infiniti Poses’ Enchantment collection, and my hair is a recent Exile release. Definitely be sure to stop by Enchantment before it ends at the end of the month! 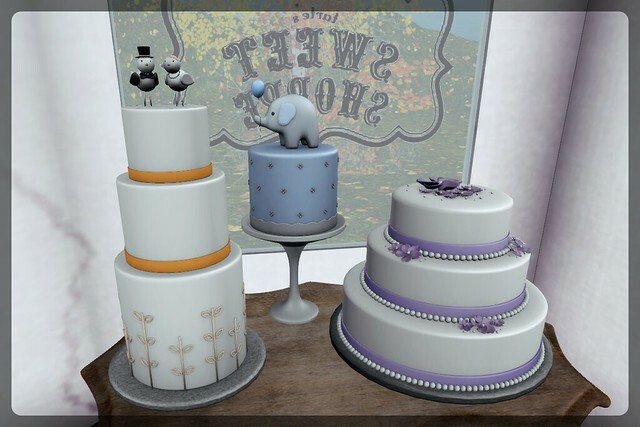 Not only are all of these goodies (and more) available exclusively at the event, the event design itself is stunning. tea.s: Her Reign crown – Silver We Love Roleplay! Shoetopia has to be one of the year’s most highly anticipated events, and it opens later this week! This is a charity event that benefits Soles 4 Souls, and I’ve seen a preview of the build and it’s stunning. 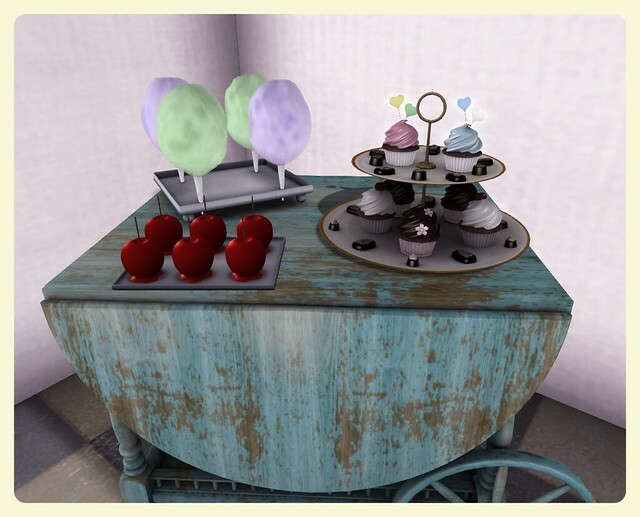 In addition to some of SL’s finest shoe creators, there is a gacha component (because we all need our gacha fix) that will feature a wide variety of items. I know I am really exited about this event. In this post, I present to you one of the many items that will be available at Shoetopia when it opens November 15th. These adorable flats are from Sax Shepherd Designs, and they come in a wide variety of colors and texture options. 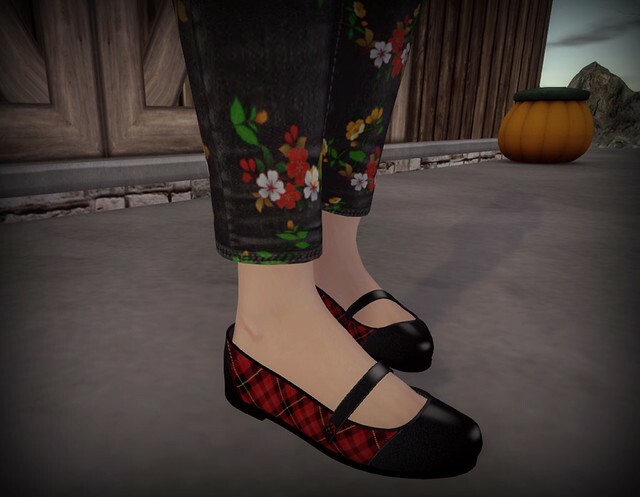 They also have a version for SLink feet and a version for system feet, so those of you who aren’t SLink feet wearers can still buy these adorable shoes. They’re like what would result if a saddle shoe and a Mary Jane got together and had a baby. I’m a huge fan of both saddle shoes and Mary Janes, and so I just love these! I am wearing the SLink version, btw. I recently bought this beautiful Barnesworth Anubis house at The Garden event (now out at the Mainstore). The minute I saw it, I knew I needed it. I love these rustic style homes, especially for autumn and winter, and I think this will be a lot of fun to decorate for the holidays. Right now you only get to see the outside because the inside, well… it’s cluttered (and not in a good way) with furniture and, uhm, moving boxes (hah). I am wearing a sweatshirt from Mon Tissu that’s been on my personal “to buy” list for ages. I decided to treat myself to something (that wasn’t from an event, as has been the case so much lately), so I went and checked out my Wishlist to remind me of what I’ve been wanting. 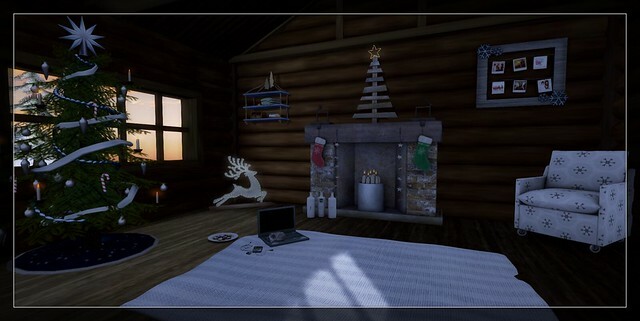 I don’t know if you’ve seen the SL Wishlist website, but it’s awesome. I find it an easier way to keep track of the things I want to buy in the future than using the Marketplace favorites list. If you don’t have one of these yet, check it out! With the holidays coming, it can be a helpful thing to use to help friends out with gift buying. I’ve been told more than a few times by my friends that they don’t ever know what to give me because of my blogging. I know it’s hard to shop for my fellow blogger friends, so I figured this is a cool, free and fun way to keep track of my future “must-haves” and if someone is generous enough to give me a gift off it, I’m very grateful. Chrome has an extension for it, and you just click a little box from the Marketplace page to add things to your list. It’s really handy when you’re browsing! Finally, my new eyes are from A.D.D. Andel! I don’t typically wear mesh eyes. See, I have this nasty habit of wearing folders and I just know me… I’d wind up bald and stark naked with 20 pairs of eyes on. On top of that, I am the world’s fussiest person when it comes to SL eyes, and for ages now (probably well over a year) the only eyes I’ve liked are from IKON. But I have always thought that it might be fun to play with heterochromia, and have different colored eyes in SL. My RL great-grandmother had heterochromia, and she had one grey-blue and one hazel-brown eye. I always thought it was lovely, and I really think these eyes are, too. My gorgeous, adorable skin is Elvi from Glam Affair. This is a Collabor88 release. There are a lot of makeups available for Elvi, in the lovely America tone at the new round of Collabor88 so definitely check it out! I will have more from Shoetopia soon! Be sure to check back.